"Jordan" earrings in Spring/Summer colors. Jordan earrings in spring colors. These are our new "Jordan" earring designs in Spring/Summer colorations. From this year's hottest color; Emerald green to a refreshing Lemon Zest yellow, to a combination of vibrant Tangerine & deep Monaco Blue... we will have a color combo for every outfit and social event. The "Jordan" earrings will be available in late June, early July 2013. "Catherine" earrings in Spring/Summer Colorations! The Top Three Designs have been chosen! Well, we have three clear winners out of the 10 "rough" earring designs! You spoke and it was evident that these designs were the favorites. #5 was the clear leader, and #'s 3 & 8 were right behind and tied for 2nd place... so we've decided to drop all three into the production pipeline! If you voted for any one of these designs then you will be entered into the drawing. Two lucky winners will get choose their favorite pair of earrings from these three designs, and in their coloration of choice. The winners will be announced on Tuesday July 15th on our "Demian&Alex" Facebook fan page, and will be notified VIA the email address given when this entry form is filled out. This date is subject to change depending on the progress of the collection. We want to insure the winners don't have to wait long to enjoy their new earrings! What happens now? We will begin work on refined design renderings that will detail the stones, settings and textures. We would love to hear your input on stone colors and combinations, so please... suggest away! We'll be sure to post the designs as they progress through the rendering process and when the first prototypes are in hand, so be sure to follow this post! Gold "Sofia" Fortuno Locket Giveaway Winner! Well, we have a winner in the "Gold Sofia Locket Giveaway" online promotion! The winner is Marissa Hopper of Austin, Texas... Congratulations! We would like to thank all of you for entering our online promotional contest and hope you will take part in all of our upcoming competitions as well! Here is the method in which the winner was chosen. A list of all entry names was compiled in a spreadsheet. The names were entered in the order that they were received. (The order in which they were received had no affect on the selection process). We used "Random.org" to generate a totally random sequence of numbers from 1-130 (the number of entries) which was inserted in the spreadsheet column adjacent to the name column, and sorted the names VIA the random number sequence in ascending order. Whatever name landed in row #1, is the winner! Adamo Fortuno heart locket necklace says "I love you" in so many languages. Adamo Fortuno heart locket necklace. This is the new "Adamo" Fortuno heart locket necklace. Nothing says "I love you" like the unique "Adamo" Fortuno Locket and all of its beautiful detailing. It has the word "Love" in four languages and the arrow through the heart says it all. You can customize this heart locket necklace with a personalized photo, birth stones and other precious trinkets. There are chain options to fit all styles and personalities; from this chunky sterling silver fortuno chain set with turquoise & pink morganite stones, to a classic antiqued rolo chain in any length, to a base metal ball chain; you can customize away! You can browse the "Adamo" Fortuno heart locket necklace here>>. 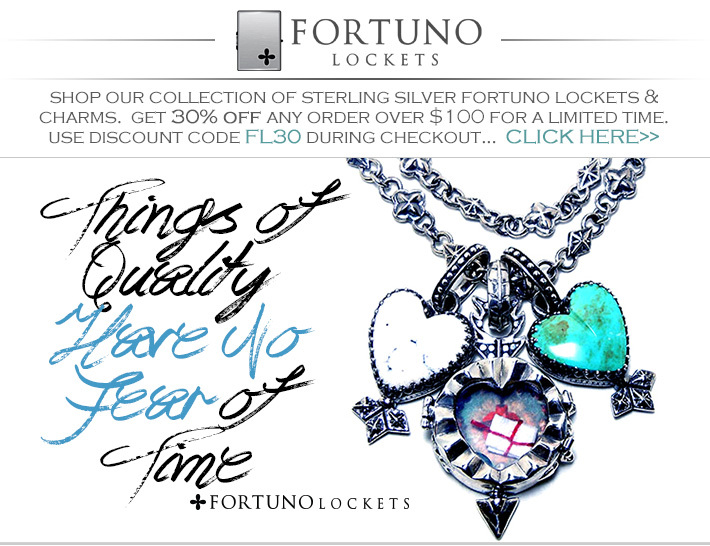 "Things of Quality Have No Fear of Time"
Shop our collection of sterling silver fortuno lockets & charms. Get 30% OFF any order over $100 for a limited time. use discount code FL30 during checkout... This offer is good until March 10th. "RAPHAEL" FORTUNO LOCKET IN GOLD VERMEIL VALENTINE'S DAY PROMO. Rectangle "Raphael" Fortuno locket in gold vermiel. This locket comes with two pearls of wisdom, an envelope of sacred, healing earth from the Sanctuary of Chimayo in New Mexico and a blue bead to keep away the evil eye. This "Raphael" comes with the sacred heart image paper insert. These images are temporary and easily replaceable with any image you choose. 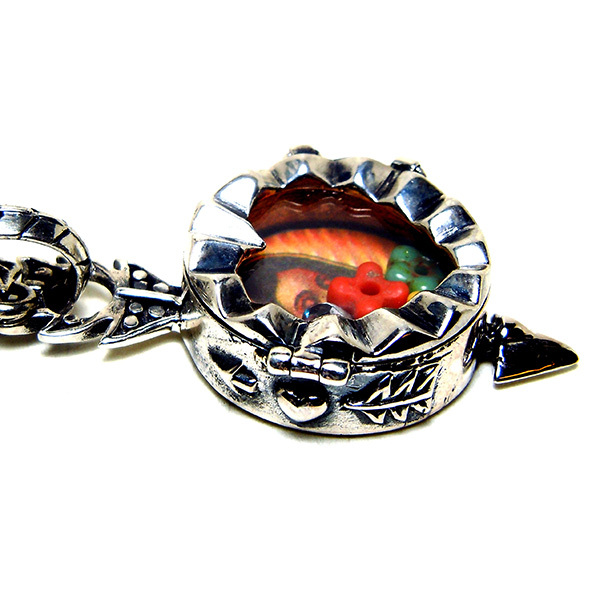 This Fortuno Locket comes standard with the sacred heart image insert, two "pearls of wisdom", an envelope of sacred earth from "Sanctuary de Chimayo" in NM that is said to have healing powers and a blue bead to keep away the evil eye. "Sofia" Fortuno Locket $67 for Valentine's Day Promo. We are offering our "Sofia" Fortuno Locket in gold vermeil on a gold vermeil ball chain at %40 off for Valentine's Day. There are a very limited number of this combination at this price. This will make an incredible gift for that special person in your life: your Mother, wife, sister, or best friend. Sterling "Sofia" Fortuno Locket & polaris stone charms. This is the sterling silver "Sofia" Fortuno Locket carved and cast in sterling silver. It is detailed with the Fortuno (Good luck) clover on the front and around the encasing and on the front of the oval bale. Accompanying this locket are three of the Fortuno stone charms in swiss blue topaz, green amethyst and citrine. All three stones are cushion cut, set in sterling silver and adorned with the Fortuno "Polaris" icon. Also on this necklace is the sterling Virgin clover. The charms are hung from an antiqued rolo chain with a yellow sapphire link. Austin Fashion Week Awards Show at the ACL Live theater. This is our brand new line of cocktail rings. We are using semi-precious stones in all shapes, colors and sizes and setting them in our signature, hand carved D&A ring shanks. Retail prices will range from $155 to $425. Custom stones and sizes available upon request. These are not yet available for purchase on our website, but if you would like to pre-order, please contact us at alex@dandadesigns.com, or 512.797.9963. And please feel free to leave a comment right here on our jewelry blog! This is the necklace we submitted for review by the Austin Fashion Week board. After review, we have been asked to be a showcase designer at AFW. We have been paired with Toni & Guy to put on an event, so we're thrilled to be a part of this! This necklace will be available for purchase soon! Please contact us for prices and purchasing info - 512.797.9963, alex@dandadesigns.com. New hand carved and cast sterling silver dog tags by Demian & Alex Vazquez. These are our brand new hand carved and cast D&A dog tags, cast in sterling silver. These are smaller (1.5"X1"), chicer and sleeker, with lots of nice, hand carved details. These currently retail at $359 a piece, and come with your choice length of chain. We have these in tons of variations with skulls, sacred hearts, pearls, turquoise, cushion cut blue topaz and lots more. Please feel free to contact us about a custom pair... we can do that! Also, please feel free to leave us feedback right here on our blog site! Bronzite & Sunstone "Three Virgins" Stone Bracelet by D&A. The "three virgins" stone bracelet by D&A is made from heavy bronzite & sunstone stone beads with three signature D&A Virgin clovers in sterling silver. Retail price on this piece is $325.00. New stone bracelet line by Demian & Alex Vazquez - "D&A". This is a piece from our new stone stretch bracelet collection. This particular bracelet is created from 12mm round, red tigers eye stone beads as well as african vinyl beads... for all of you record lovers out there. This stone bracelet also has five of our brand new D&A good luck animal charms, carved and cast by D&A artisans in sterling silver. Retail price for this piece is $445.00. D&A Dog-Tag Poster... just because. Brand New "STUNG" Heart by... us. This is a brand spanking new piece in just in time for Valentine's Day titled the "STUNG Heart". Carved and cast in solid sterling silver it's a weighty, stand-out piece. On the front you'll see our little D&A bee which have long been considered as good luck. If you've seen our "Spanish Heart" it has the same weigh and dimensions. You can order the silver STUNG heart pendant with a variety of chains. From the silver and black spinnel chain in the image above, to a pearl chain, emerald chain, solid silver box chain, or a silver vermeil chain... which we would throw in for free. (silver vermeil chain only) These are so new they are not in stores yet, so we are offering our online friends this piece at wholesale through Valentine's Day. If you'd like to purchase one, email us... alex@dandadesigns.com. New Visigoth & 16th Century Inspired Sterling Collection by Demian & Alex.